I hope you are enjoying your break. As you know that CHS Choir Program Sponsors the CHS Talent Show. We need your help in putting out the word that auditions are next week. Anyone at CHS is eligible to audition. Audition information can be found at www.coppellchoir.com/talentshow. Feel free to pass that along to your friends. We will be auditioning for Emcees on December 2, and will be auditioning the Talent Acts and Respira Dessert Show Fillers on December 4. Sign up for your slots today! See you next week! 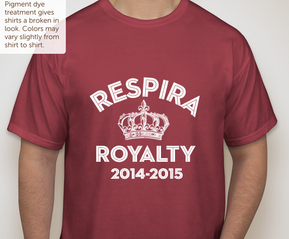 While you are with family and friends this Thanksgiving, take a moment to share with them the joy that is OUR RESPIRA ROYALTY SHIRTS. They are $15 each and can be purchased from any of the girls in Respira. They make excellent stocking stuffers and thoughtful gifts for the Holiday Season. They are a great way to show your support to these outstanding young ladies! Also, you can purchase your tickets for the Respira Holiday Dessert Show online TODAY by visiting www.coppellchoir.com/tickets! We are looking forward to an amazing show! PreArea Singers click here for information about tomorrow’s contest! Click here to read the information for this Saturday’s Clinic and Concert. Tomorrow evening is our mandatory Region Choir Rehearsal at South Grand Prairie High School. You will need to bring a sack meal for dinner with you. We will provided bottled water. You will also need to have all your music in a folder and a pencil. You can check out the blog at http://www.coppellchoir.com to see a list of the pieces for your choir. You will need to report to the choir room as soon as school is out. We will check roll, load the buses and leave. We should return around 9:30 PM. You are welcome to bring homework with you, but will need to be very careful in guarding any electronics or personal belongings. As our performance on Veteran’s Day approaches, we want to let you know some scheduling information. Singers will need to bring their performance dress with them to take to the majestic. It is highly recommended that ipads stay locked at CHS so they are not lost or stolen on this trip. Singers will be excused from 6th and 7th Periods. Out of respect to our Veteran’s as well as to the people who invited us to be a part of this, we ask that all singers stay until the end of the event. Parents may pick their singers up at the conclusion of the event if they have completed the Alternative Transportation Form. Please let Mr. Brown know by email if you plan to pick up your singer – jbrown@coppellisd.com. Choir members will not have to pay to participate, parents and family members will need to purchase tickets to attend. You can purchase your tickets online athttp://www.prekindle.com/promo/id/23543011511940084. All Region Choir Rehearsal – November 10 (evening) – we will leave immediately after school by bus and will return around 9:30 that evening. This is required for ALL Region Choir Members. Singers will need to bring a sack dinner with them that evening. They will not have time to leave school to go get food since the buses will leave right after school. We will provide bottled waters. All Region Choir Clinic and Concert – November 15 (All-Day) – Singers will need to arrive at CHS at 6:30 am. The concert will begin at 4:30 PM. Admission is free. As in years past, we will not be providing transportation back to Coppell. Students and parents will need to arrange transportation home for their singer. We will be providing their lunch on Saturday, November 15. All singers will need to complete this form: http://tinyurl.com/regioninfoform All singers must have all their music and a pencil for both of these rehearsals/clinics. Please let us know if you have any further questions. Congrats again for having your singer be selected for these prestigious choirs!